Legacy Christian’s Emily Hess puts up a shot against Xenia’s Kamea Baker, in the first half of Monday’s Jan. 28 girls high school basketball game at Xenia High School. Senior Danielle Matthews of Legacy Christian goes up for a score, as Reaghan Wakefield tries to draw the charging foul, in the first half of a girls high school basketball game Jan. 28 at Xenia High School. XENIA — The scoreboard didn’t show it, but both coaches knew it. 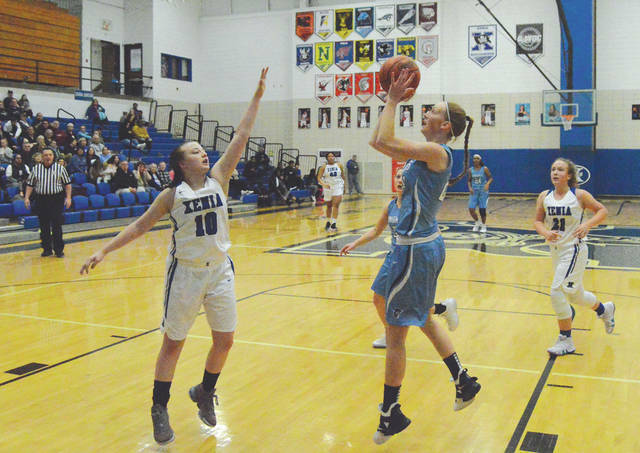 The host Xenia Buccaneers played what their coach described as their “best game of the season,” in a 60-28 loss to a very talented Legacy Christian Academy girls high school basketball team, Jan. 28 at Xenia High. Legacy Christian’s only two losses this season have come on the road to Waynesville and Alter. They’re 15-2 overall, and atop the Metro Buckeye Conference with an 8-0 record. They average 55.5 points a game while holding opponents to 29.5. They’re good. But the visiting Knights were clinging to a 15-10 lead after the first quarter of play. LCA upped the defensive pressure in the second quarter, however, and the Knights parlayed seven Xenia turnovers into a 17-3 second quarter and a 32-13 lead at the half. Emily Riddle led the Knights with 19 points, Emily Hess finished with 16, Matthews added eight points and Leach tossed in seven. 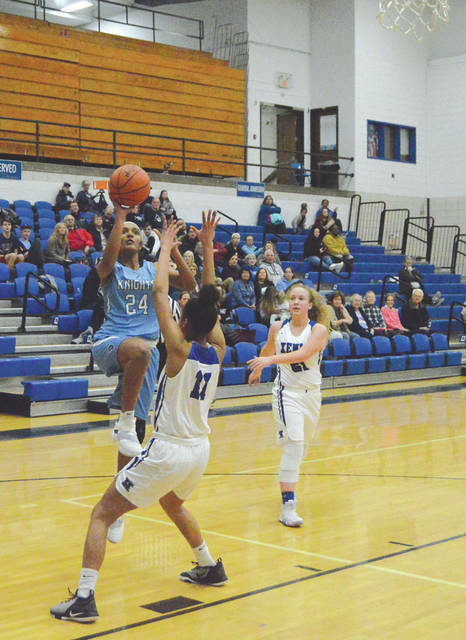 The Knights had scored the second most 3-pointers in a girls high school basketball game in state history earlier this season with 21 in a romp over Miami Valley. With a game-plan that emphasized passing and ball control, LCA still drained eight threes in Monday night’s win. Combs used a common opponent — Greeneview — as a measuring stick to show Xenia’s improvement. On Dec. 17, LCA defeated Greeneview in Jamestown by a 49-32 margin. Xenia opened the season in Jamestown and got blown out, 79-18. Seeing that the Bucs held their own for much of Monday night’s game with Combs’ Knights was all he needed to see to realize that the Bucs are vastly improved this season. Mardis led the Bucs (1-18, 1-11 GWOC South) with 17 points, 15 of which came from 3-point range, Baker finished with nine points and Haley McManus had Xenia’s other score. Xenia plays at Trotwood-Madison next, a 3 p.m. Saturday, Feb. 2 game in Trotwood. LCA hosts Carlisle for a 6 p.m. game on Tuesday, Jan. 29 for its next game.